my goodness, i can't believe that my first week of classes are over already...and i've learned that when you are busy time just flys by, kinda crazy yet so amazing. oh, and surprisingly my classes aren't as awful as i expected(thank god) and you know how i was telling you about botany in my last post? well, my teacher is a jester of all sorts...so at least i'm being entertained while learning crazy material!!! but on a completely different note...my birthday is on monday!!! i will be saying bye bye to my teen years and hello to the twinkling twenties! (parttyy) i'm so excited to go home and spend my birthday with all the ones i love and well i have my birthday off of school since it's martin luther king's day! lucky me, yeah? have a colorfully peaceful weekend! 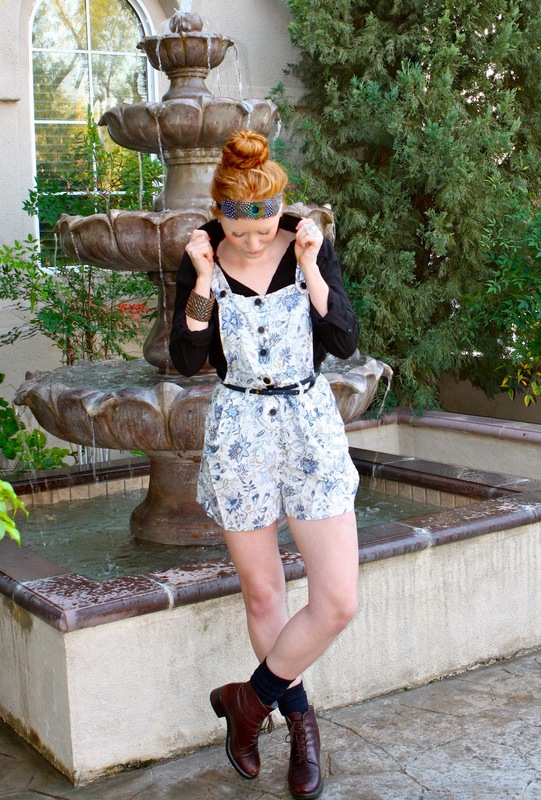 Great print romper! I like headpiece too! Your overalls are so cute!! i really love your shoes! with my two months of holidays I'm sort of excited to get back to school too. Those overalls are really fun and outside the box and I adore the funky headband. I really like this, and happy early birthday! Well happy early birthday! Your plans sound so fun! Botany is one class I never took :) Those overalls are so amazing, how long ago did you get them? what a wonderful blog, i love it! keep up the good work, and i'll keep coming back! You look soooooooo cute dear! 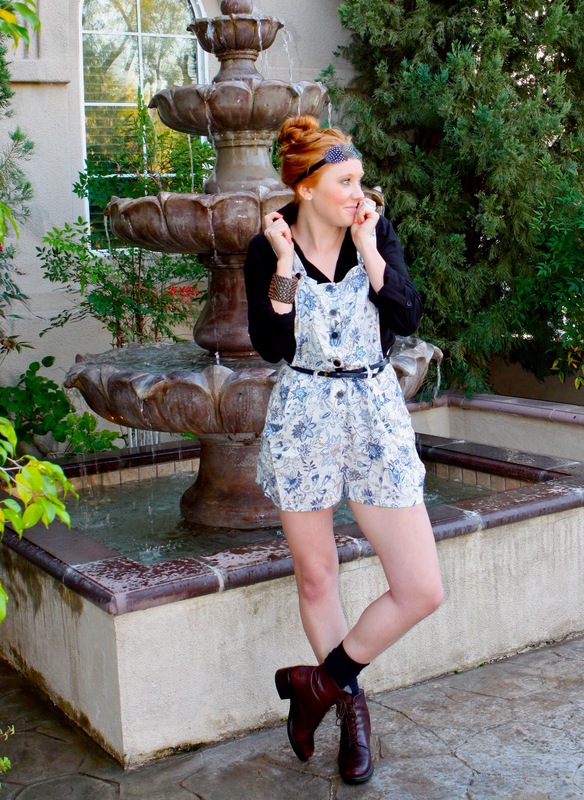 cute romper - you pull it off very well. love the print too! Those are awesome. The way you wore them is great. Love this! Love the headband, the whole outfit is just super cute and kind quirky. Love it! those boots are incredible, what a find! combat boots are the best, remind me of when i was younger. It's your birthday!!! Happy birthday love, hope you're having an amazing day so far!!! Now as for this outfit...I have NEVER thought about wearing overalls, but I'm seriously having some overall-envy right now. These are so amazing and I love the chic, fun way you styled them! Love your outfit and that headband is just too pretty. Hope you had an amazing time celebrating your birthday. Just found your blog, love it. I'm following. Hope you can stop by soon. You´ve a great blog and I love your sweet headband! Those overall shorts are incredible - they remind me of a pair I had years ago that I was head over heels in love with and just couldn't let go :) And that peacock hairband is just stunning! 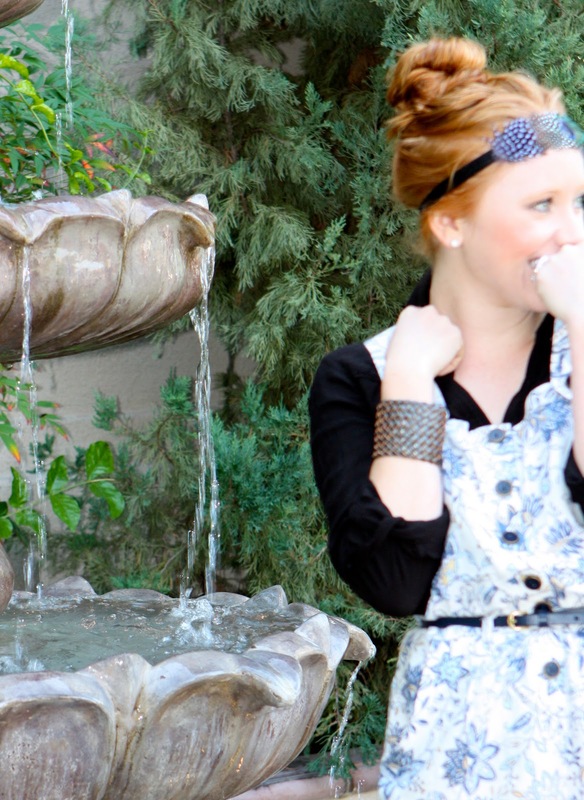 Love the headband and it is the cutest pair of overalls ever!! you have great style! You look stunning in this original look! 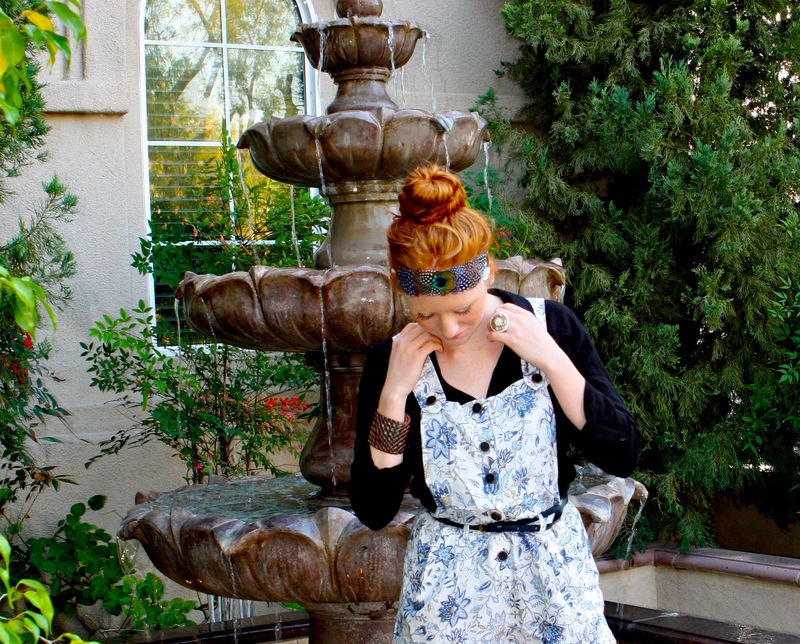 Your overalls are so cute, I love how you wore boots with them! And your headwrap is so pretty, the feathers are great :) now following. oh YES they can!! You really wore these overalls SO WELL!! I LOVE the print on them!! so adorbs...and they work so well with the peacock headband!! there you go with those amazing headpieces! love the vibrant colors of the peacock feathers. cute overalls, too!! i absolutely LOVE, LOVE, LOVE this peacock headband! incredible. next to your gorgeous red locks, i am so obsessed. Hi dear! Thanks a lot for your comment in my blog! I love that outfit! The jumpsuit is so cute! You look like a little gril but totally on vogue! I am a big fan of your hairpiece here. Love the title of your post - a bit thumbs up for your outfit here too. I absolutely LOVE this outfit. The overalls are awesome. fell in love with the overalls, great look! What an amazing piece!!! Those overalls are just perfect! One of my absolute favourite outfits of yours!